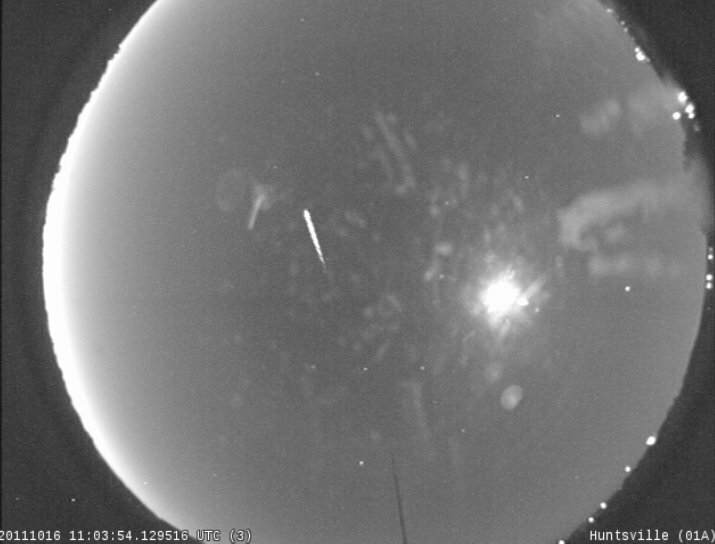 On the night of Oct. 15-16, NASA’s All-sky camera network saw meteors from five different meteor showers! October is known to be a busy month in the world of meteor showers, but even five is an unusually high number. The last meteor seen in the early morning skies over Huntsville, Ala., on the night of the Oct. 15-16. To see videos of these meteors, and others, go to fireballs.ndc.nasa.gov and select 20111016 on the left panel. In addition to those five shower meteors, eight sporadic or background meteors were detected. The five showers were: Delta Aurigids, or DAU, October Ursa Majorids, or OCU, Chi Taurids, or CTA, Orionids , or ORI, and Eta Geminids, or EGE. See the list at the end of this post for more information on each shower. The only shower mentioned above that would be worth observing for yourself is the Orionids. The Orionids peak this Friday evening — the night of Oct. 21-22 — and are best viewed anytime after midnight. They are one of the last showers of the year that may have favorable weather to lie outside all night. If you are in Northern Alabama, October evenings are still quite pleasant for stargazing. Luckily for you the moon won’t be too much of a problem. Only a small fraction of the moon is illuminated, unlike many major meteor showers this year whose rates were considerably hampered because the light from a full moon washed them out. Delta Aurigids, or DAU: Active from Sept. 20 — Oct. 16, peaking on Oct. 3 with only two meteors per hour. Velocity of 143,000 miles/hour. The Delta Aurigids are not a well-known shower thus any observations refine the information we know about them. October Ursa Majorids, or OCU: Active from Oct. 12-19, peaking on Oct. 15. Velocity of 119 miles/hour. This is a very minor shower rates of less than one per hour. Radiant — where the meteors appear to come from — is in Ursa Major. Chi Taurids, or CTA: Active from Oct. 10 — Nov. 10, peaking on Nov. 3. Velocity approximately 94,000 miles/hour. This is also a shower that has very little known about it. It was recently discovered in a survey to find minor meteor showers using a meteor radar (Brown et al, 2010). Orionids, or ORI: Active from Oct. 2 — Nov. 7, peaking on Oct. 21 with rates up to 25 per hour. Velocity of 150,000 miles/hour. Radiant is in the constellation Orion. Eta Geminids, or EGE: Active from Oct. 14-27. Peaking on Oct. 18 with rates of three per hour. These are fast-moving meteors that average at 157,000 miles/hour. Eta Geminids are often confused with Orionids since their velocity and peaks are similar. Brown, P., Wong, D.K., Weryk, R.J., Wiegert, P.
Route 129 traveling east in Loudon, N.H. @ 9:30 p.m. Eastern Time, of just before the 25 m.p.h. curve, did see a fireball streak for quite a distance, and then flickered out in middle sky, thinking what? of this a meteor to a meteorite into Lake Winnipesaukee?